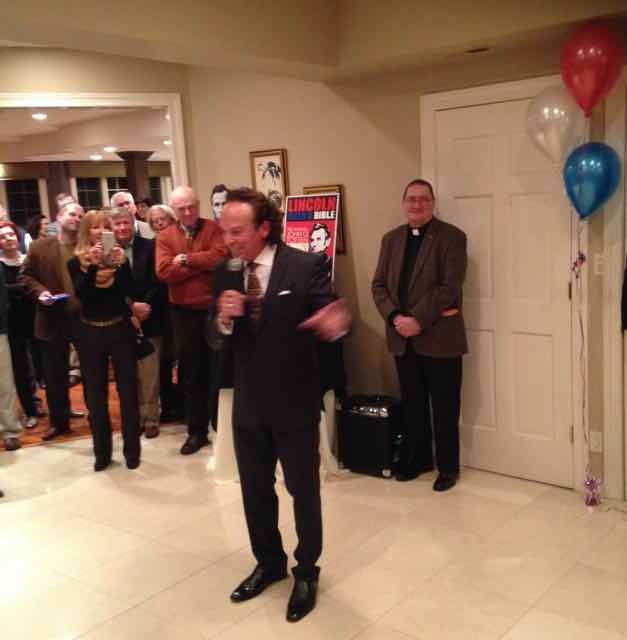 Fresh New Montco Republican Party Looms — Stan Cascio has let us know that 100 persons of varying political identities attended a soiree at his home to create a fresh new Republican Party of Montgomery County. He says there were Tea Party conservatives, establishmentarians, two independents and one Democrat, whom he declined to name. Among those in attendance were official GOP county head LIz Preate Harvey; the wonderful and influential Dom Giordano of WPHT; and county commissioner candidate Sean Gale, the brother of county commissioner and running mate Joe Gale . Stan says everyone in the room agreed on 80 percent of things. Stan says like-minded people — those who love freedom, hate corruption and lies, and recognize that rights are God-given — must unite else the neo-feudalists i.e. the New Democrat Socialist Party that holds that some animals are more equal than others will prevail. Stan, who is running for county controller, said the county GOP has agreed to refrain from making endorsements this primary election. Stan expressed disappointment about ads being run by the Gale brothers attacking the establishment. “We must stop forming circular firing squads,” he said. Stan had a great observation about border security and immigration vs illegal immigration. Of course, we know the answer. Rules for thee but not for me. Stan Casacio Launches 4th District Write-In Campaign — Stan Casacio, who perceptively launched a GOP primary challenge to Pennsylvania’s then 7th District incumbent congressman Pat Meehan two years ago, — it sure would have been nice if he won, right? — has launched a write-in campaign for the May 15 GOP congressional primary to challenge Dan David, who is the only name on that GOP ballot for what is now the 4th District, after the court-mandated shuffling. It should be noted that Joe Billie, who was preparing a primary challenge to Meehan before his resignation and before the redistricting, has also said he is running a write-in campaign for what is now the 5th District. The only GOP name on the ballot there is Pearl Kim. The new 4th and 5th districts skew far more heavily Democrat than the old 7th District did. Two years ago, I challenged Pat Meehan in a primary. I knew it would be difficult to argue for conservative realism, common sense and fairness against an entrenched establishment “Run for the Hills” Republican. Recently, many people who supported me two years ago have called asking me to run again on a grass roots “write in” campaign. It is very humbling when people who believe in the American Dream, like I do, call to say they want me to represent Pennsylvania’s new 4th District in the U.S. House of Representatives. It is deeply concerning to me that achievement of the American Dream – the freedom and opportunity to realize happiness and prosperity through personal initiative – is now in jeopardy. Clearly, the establishment Republican Party has for the most part abandoned the fight for equal justice for all, the right to life, and the right to protect yourself and your family. It has supported increased taxes and spending at local, state and federal levels. The establishment Republican Party did not veto Obamacare when it had the opportunity, did not fight to protect our boarders from illegal crossings, and has stood aside or actually participated in the witch-hunt against President Trump. These actions and many others threaten the opportunity for citizens to pursue the American Dream. The new federal budget steals our hard-earned income and uses it for purposes we oppose. It continues funding of Planned Parenthood, for example, which stops the life of unborn children. If wealthy billionaire liberal Democrats want Planned Parenthood to continue they should fund it themselves. They should not use our taxes because many of us are pro-life and oppose abortion on moral and religious grounds. Sadly, there are three legal systems operating in the U.S. – one for people who are wealthy, powerful and well-connected, one for liberal Democrats, and one for the rest of us. Frankly, I have had enough of gutless Republican legislators who stand for nothing, because that’s the politically shrewd thing to do, and they accomplish nothing that their constituents want! I believe the strength of America is that we love to chart our own course in life. We were born to do this – our parents, grandparents and so many other immigrants came here from all over the world because only in America can a person from an ordinary background enjoy life, liberty and the pursuit of happiness. I also believe that liberalism and the establishment politicians of both parties pass laws that undermine our Constitution, take away our rights, and threaten to replace our customs and traditions with socialism. Americans believe that nothing is right if it is morally wrong. Think for a moment about the abysmal failure of liberal, socialist countries. Take Venezuela, for example. A country once thriving is now steeped in poverty and lawlessness. Liberals and establishment types believe that we all must think and act the same and when we don’t, they create new laws to take away more of our rights. What to do? I am reaching out to you because you are politically interested and active to some degree. A write-in campaign is hard to win. It truly is grass roots work. Success requires a driving force of supporters who believe in the massage and the messenger. If I win this write-in campaign, first, we will all make history! Second, I will take on the challenges we face with common sense and a firm commitment to uphold the American Dream. I will always refer to the money the government takes from us as taxes! Politicians always talk about revenue to the government – government does not produce anything other than paper work and more regulations. Adding more regulations means taking more rights and money from us. I will recognize that there are males and females – and there are differences among them. Members of both sexes deserve respect and equal opportunity, not because they are women or men but because they are us – the human species. I will do everything I can as your legislator to protect life, and not harm or destroy it. Our country spends billions to find life on other planets but neglects and mistreats people and the environment on earth. Our borders are entry points for drugs and bad actors. We need to know who will come into the United States to do us harm and who wishes to join us as citizens or visitors to live peacefully among us and help make our cities and towns safe and prosperous. Drug cartels make billions buying off the politicians, judges and other public officials. The opioid crisis is horrific; it is killing our youth and must be ended. Sanctuary cities are drug distribution points. I will work to stop illegal aliens from entering our country and bring justice to those engaged in drug trafficking! 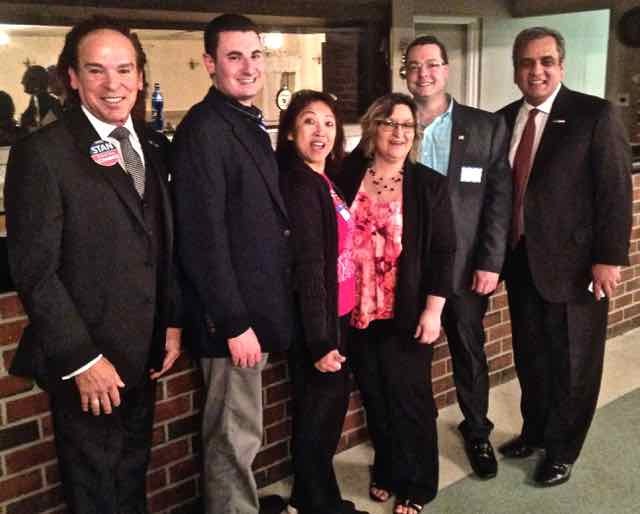 With Stan Casacio (left) are Montgomery County Commissioner Joe Gale, Chester County committeewoman Donna Ellingsen, Penn Delco School Director Lisa Esler, John Haenn of Springfield, and Joe Peters who is running for Pennsylvania Attorney General. Casacio Confident Of Win — Stan Casacio expects to beat incumbent 7th District Congressman Pat Meehan in the April 26 Republican Primary. 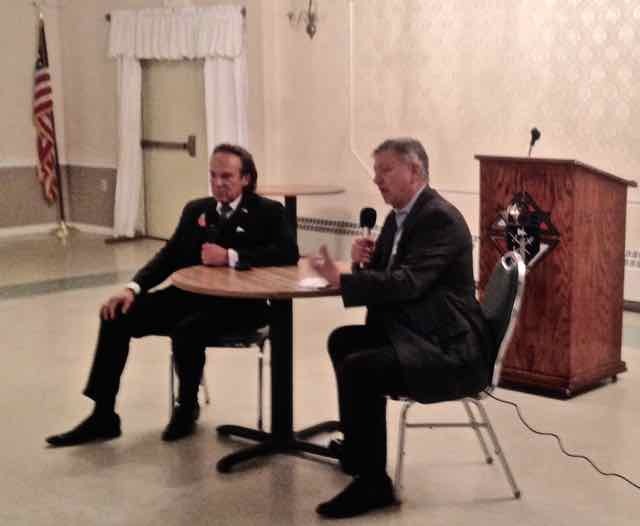 He said it tonight, April 4, in an interview with WPHT talk show host Dom Giordano before a crowd of about 50 at the Newtown Square Knights of Columbus Hall. The event was sponsored by the Delaware County Patriots and featured other political notables such as Montgomery County Commissioner Joe Gale and Joe Peters who is running for Pennsylvania attorney general. Peters’ long law enforcement resume includes the murder conviction of Philly mobster Nicky Scarfo. “We are going to win,” Casacio said confidently. It was his answer to a question of a possible third party candidacy if he should lose. Casacio, 68, is a Montgomery County builder who has long been active in Republican politics. Casacio was motivated to run after Republicans failed to advance the agenda they rode to landslide victories in 2010 and 2014. He said that Meehan was a nice guy but has been in opposition to necessary Washington reforms far more often than not. One group has him voting with conservative reformers just 31 percent of the time, Casacio said. Casacio pointedly noted Meehan’s votes to increase our debt ceiling which has led to our debt now being over $19 trillion. He also noted that he was the only Republican to vote against the VA Accountability Act of 2015 which would have made it much easier for the Department of Veterans Affairs to demote or fire employees based on poor performance and offer increased protection for whistleblowers. Both he and Giordano, blamed Meehan’s close ties to Philadelphia union leaders, especially John “Johnny Doc” Dougherty who runs the powerful Local 98 of the International Brotherhood of Electrical Workers, for his curious VA vote. Casacio, who is strongly pro life, also took issue with Meehan’s vote to pass a federal budget that provided funding for Planned Parenthood. Meehan’s reasoning is that failure to do so would have shut down the government. Casacio noted there was nothing to stop Congress from sending funding bills piecemeal to the president which is much the same way the Pennsylvania Legislature recently forced Gov. Wolf’s hand. He noted that doing so would require Congress to work harder, however. Casacio also noted that regulation must be brought under control and that every regulation made should require a direct vote by Congress. He also said he supported term limits and a bill requiring such would be one of the first things he would sponsor. He said corruption is almost inevitable for someone who spends a long time in Washington. He said his age means that he is automatically term limited. John Haenn of Springfield made the introductions. Gale also spoke briefly as did Giordano before starting his interview. Giordano criticized the Delaware County Republican Party for their choice of candidates in recent elections and gave a shout-out to Lisa Esler, who was in the audience, for her independent run in last summer’s special election for the vacated 161st District State House seat after the GOP picked union boss Paul Mullen as their candidate. Peters was the last to speak. He described his background which included being a beat cop, deputy State Attorney general, and federal prosecutor. He noted that State Sen. John Rafferty, the political insider endorsed by the state party, has taken union money and sabotaged reforms to make state government cost-effective and accountable. Dom Backs Casacio At Delco Event — Montgomery County businessman Stan Casacio, who is challenging incumbent 7th District Congressman Pat Meehan in the April 26 Republican primary election, will explaining his candidacy before the Delaware County Patriots, 7 p.m., April 4 at the Knights of Columbus Hall, 327 N. Newtown Street Road, Newtown Square, Pa. 19073. Stan Casacio at his campaign kick-off in January. He will be introduced by WPHT talk show host Dom Giordano. Doors open at 6:30 p.m. Light refreshments will be served. Please RSVP by calling 484-995-1540. Stan Casacio announcing his campaign in January. 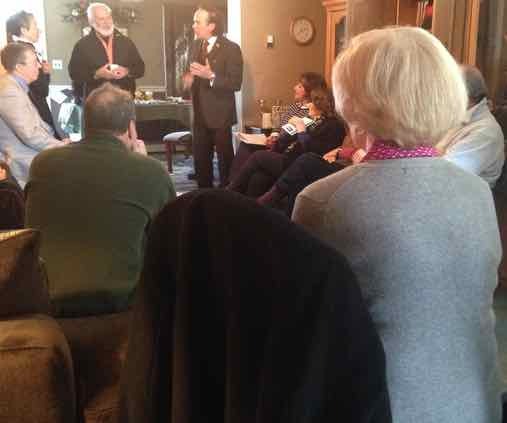 Casacio Newtown Square Meet And Greet — Stan Casacio, who is taking on incumbent 7th District Congressman Pat Meehan in the April 26 Republican Primary, will hold a meet and greet, 7:30 p.m., March 21 at Uno Pizzeria & Grill, 3910 West Chester Pike, Newtown Square, Pa. 19073. 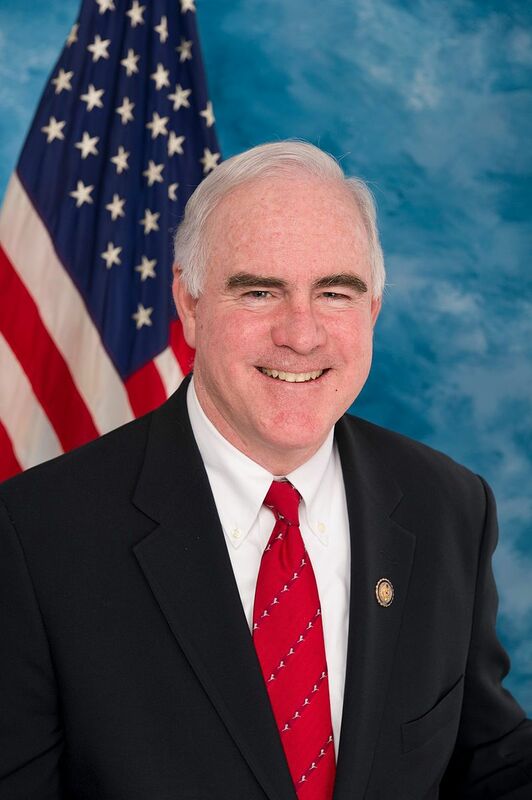 For the record, if Congressman Meehan sends us his events we will use them as well. Pat Meehan, has he opened a door for Casacio? Pat Meehan Hits Choppy Water — Incumbent Pennsylvania Congressman Pat Meehan expected smooth sailing in his cuddly customized 7th District cocoon but he has hit some chop. His opponent in the April 26 Republican primary, Montgomery County businessman Stan Casacio, got the endorsement of the Berks County Republican Committee in late February. Granted the Berks section is but a small part of the district but it is worth noting that its Republican leaders are obviously unsatisfied with the representation they are receiving from Meehan. More damning, though, is the revelation reported by Philly.com on March 4 that Philadelphia Democrats are big backers of Meehan. As per the article: Mainstream Democratic fundraisers like union leader John J. Dougherty and national fundraiser-lawyers Alan C. Kessler, Bill Leonard and Mark Alan Aronchick are joining GOP leaders Vito Canuso and Pat Deon in raising piles of cash for incumbent Republican U.S. Rep. Patrick Meehan, R-7th. So, what’s up with that Pat? If the GOP rank and file learn of this, the cost will be far greater than any benefit this support provides. You might have even opened the door for a Casacio win, something we would not have thought possible two months ago. Stan Casacio announcing his candidacy Jan. 21. Stan Casacio Gets 1500 Signatures — The petitions for Montgomery County businessman Stan Casacio were accepted, Feb. 16, by the Pennsylvania Department of State and he will be on the ballot, April 26, for the Republican 7th congressional primary. He is challenging incumbent Pat Meehan. Over 1500 names were collected. Casacio is running because of concerns about fiscal irresponsibility and uncontrolled immigration among other things. While he still faces an uphill battle, Meehan better take him seriously considering what happened in South Carolina on Saturday. Stan Casacio Gets 1500 Signatures. Stan Casacio at the Esler home. Casacio Crashes Delco — Stan Casacio spent almost two hours this afternoon, Jan. 31, on his opponent’s home turf explaining the whys of his candidacy. Casacio is a Montgomery County businessman long active in that county’s GOP politics who is mounting a GOP primary challenge to incumbent 7th District Congressman Pat Meheen. The site of the invasion was a petitioning signing/meet and greet at the Esler home in Aston. Hostess was Lisa Esler, the Penn Delco School Board member who ran an unsuccessful write-in campaign last summer after local Republican Party leaders picked a Democrat-supporting union boss as their candidate for the vacated 161st Pennsylvania State House Seat. Casacio said he was the son of an Italian immigrant who loves this country and the things for which it stands. He said existing policies abetted by Meehan will lead her to ruin. He described a fiscal policy that is impoverishing us. Meehan voted to raise the debt ceiling four times, he noted. We now owe over $18 trillion in debt. Casacio said the immigration policy now in effect is a disaster. He said that when his father arrived his desire was to assimilate and become an American, not to impose strange and intolerant laws from the land that they fled. Casacio also said he was motivated by his reverence for life. “Each life is a nugget of gold,” he said. He noted how the government has spend hundreds of millions seeking life in outer space and that merely shows how precious life is. He said that Meehan, who runs as a pro life candidate, voted to keep abortion-mill-operator Planned Parenthood funded and that he wouldn’t do it. He also noted that Meehan made robo-calls for one-time Planned Parenthood boardmember Scott Zelov in last year’s Montgomery County Commissioner Republican Primary. Zelov lost to Joe Gale, who was opposed by the party establishment and supported by Casacio. Casacio said he spent his early years in Northeast Philadelphia before his family moved to Cheltenham where he attended Catholic Schools before graduating from Cheltenham High in the same class as “Yoni” Netanyahu, with whom he was friends. It’s worth noting that Meehan also grew up in Cheltenham. Casacio stayed in Cheltenham after starting a development company with his brother and sister, and got involved in local politics serving on the township’s board of commissioners. Among those whom he helped nurture in politics was talk show host Mark Levin, who was elected to the community’s school board in 1977 at the age of 20. Casacio now lives in Whitemarsh. Casacio, who is 68, said his age naturally term limits him but he still supports making limits mandatory for everyone. Pennsylvania’s 7th District is horrifically gerrymandered. About 60-percent lies in Delaware County with the rest split between Montgomery, Chester, Lancaster and Berks counties.